While the responses of the Portsmouth Road consultation are assessed, attention can turn to the next phase of the mini-Holland plan. It’s probably fair to say that the number of responses surprised the council; one hopes for a positive outcome and ongoing engagement with people who will use this. The next phase of the mini-Holland plan is believed to be the New Malden to Raynes Park link. This is the first project-level work – the Portsmouth Road being classified as a Route. In the spirit of engagement, here’s what one might hope from in order to make this mini-Holland as Holland as possible. The council have helpfully provided a Google Maps link here. 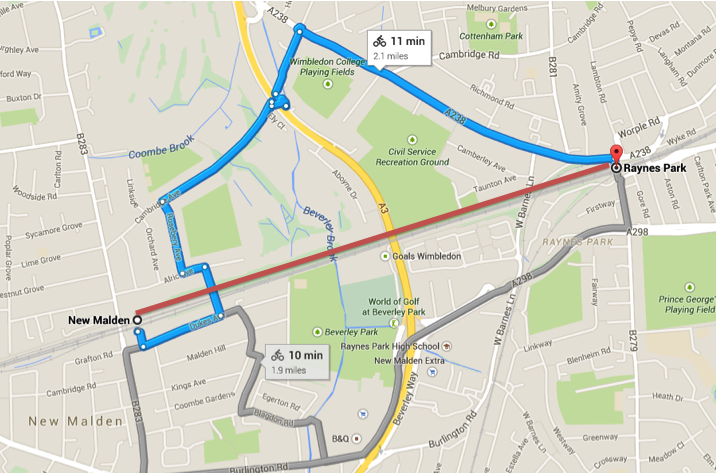 At present the journey between New Malden and Raynes Park is a 2.1 mile detour. A direct route would be hugely beneficial in connecting the boroughs, enabling many people to consider cycling when they presently use the bus, train or car. This sounds promising as a starting point. So, how would the Dutch do this? This cycle route is not located near roads, so long sightlines are needed to ensure a feeling of safety. The inherent straightness of the route will help here, as will the promised lighting. This is discussed by David Hembrow in detail here as Social Safety. Social Safety involves all the small things that add up to give a feeling of well-being when using the route. This includes commitment from the council for regular maintenance of bushes so they don’t provide hiding places for muggers, patrols by police on bicycles and removal of graffiti. All indicate that the route is looked after and cared for. Three metres sounds like a lot, but that’s slightly under 1.5 metres each way, allowing for a centre line. That’s insufficient room for cyclists to pass with traffic coming the other way. 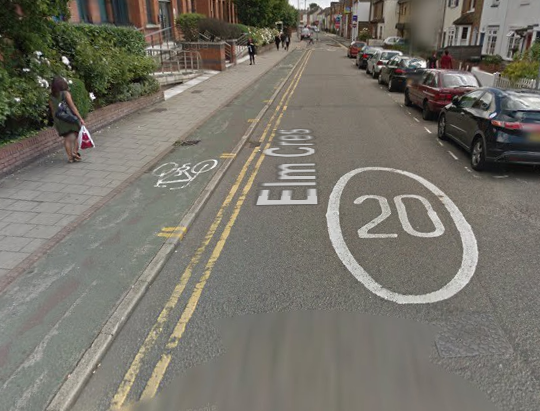 The link above to David Hembrow’s blog describes a 4 metre cycle bi-directional cycle lane. 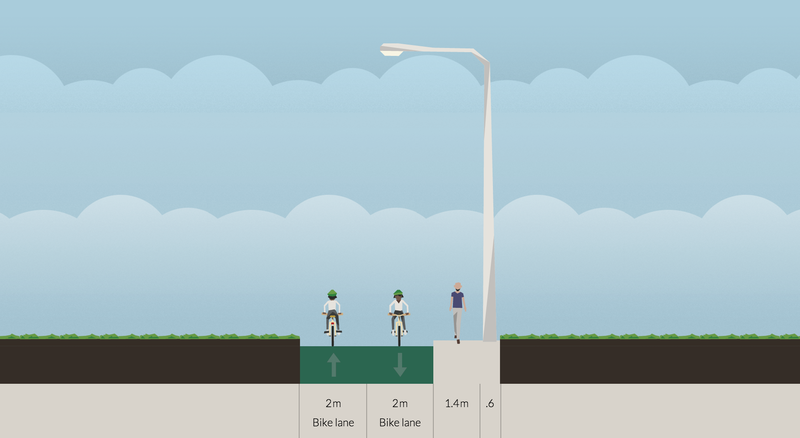 While 3 metres may be adequate right now, the route should be designed so that there is an option to go to 4 metres wide if required. Given that this route is segregated from traffic, it’s quite possible that it will prove popular for cycling from south-west to south London. It would be a pity for expensive rework to be needed later, if there’s an option available now. Four metre bike lane. Much better for cycling. We’ve all encountered those off-road paths that start poorly-surfaced, become pot-holed from ice-damage and are never repaired. Cycle traffic causes negligible surface wear, so there’s little excuse for not surfacing the route to a high standard that will last. It is likely that maintenance vehicles will drive down here, so a surface fit for motor traffic will be necessary. The route should have good drainage (but without surface drains to slide on) and very steady inclines. This will allow a smooth surface that permits fast travel between the two towns on an attractive route. Now, let’s not forget that this is mini-Holland. It’s not just another route, it’s a showcase of what can be provided. It should make cyclists in other boroughs jealous of the facilities and encourage people to get out of their cars. Given that TfL will fund much of the project, these extras could readily come from the council budget. These things aren’t typically thought of for cycle infrastructure here because people on bikes are too busy concentrating on staying alive. But once we’ve met those items on the lower tiers of Maslow’s Hierarchy of Needs, why not tackle comfort items further up the hierarchy? The Netherlands has angled bins facing toward the cycle path. This makes it easy to do the right thing; a simple glance at the mess surrounding to any street bin will show the value of this. Copenhagen has angled footrests next to traffic lights on their highways. A small thing, but it’s a signal that cycling is more than an inconvenience to the council. A service area at each end of the path (bike stand and pump) would be a huge bonus for riders and definitely what a council aspiring to Dutch levels of cycling would do. It’s another thing that removes some of the hassle from cycling. This doesn’t have to be expensive; it just has to work. So there we have it. My wish list for the next cycling route. Please do comment if there’s anything I’ve missed.